The Project Stream Box DSA available with 12 months Interest Free Credit from www.VickersHiFi.com is Pro-Ject Audio‘s new fully equipped audio streamer, that not only includes more features, but is an audiophile amplifier, too. Additional to streaming functionality the Stream Box DSA also acts as a D/A converter for other digital sources (USB, coax, Toslink) and as a pre-amplifier with 2 additional analogue sources and audiophile power-amplifier, that easily drives high-quality speakers! With this Streamer Pro-Ject have produced a highly musical device that will play all of your digital music sources. 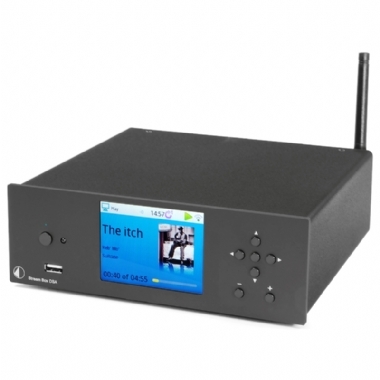 Whether you want to play from an iPod, listen to internet radio, link with your NAS drive, or unlock the potential of your HD music stored on a hard drive, the Stream Box DSA can help you. To download Box Control for iOS, click here. To download Box Control for Android, click here.